Member of the strobilurin group of fungicides is a second generation broad spectrum strobilurine type fungicide with improved protective and curative properties against main plant disease. Trifloxystrobin works by interfering with respiration in plant pathogenic fungi. The site of action of strobilurin compounds is located in the mitochondrial respiration pathway. As a result of this mode of action, trifloxystrobin is a potent inhibitor of 2 fungal spore germination and mycelial growth. 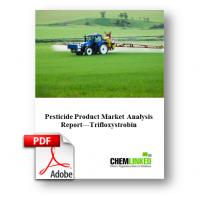 Trifloxystrobin is a broad-spectrum foliar fungicide that has high levels of activity against many fungal pathogens within the Ascomycete, Deuteromycete, Basidiomycete, and Oomycete classes. Pests controlled by this active ingredient include grape and cucurbit powdery mildew, apple scab and powdery mildew, peanut leafspot, and brown patch of turfgrasses.